When you give a Black Angus gift card, you are giving a memorable evening of fun and great food. A Black Angus Steakhouse gift card can be redeemed for juicy, mouth watering steak that has been aged and tenderized to perfection and then grilled by the expert grilling chefs at Black Angus. 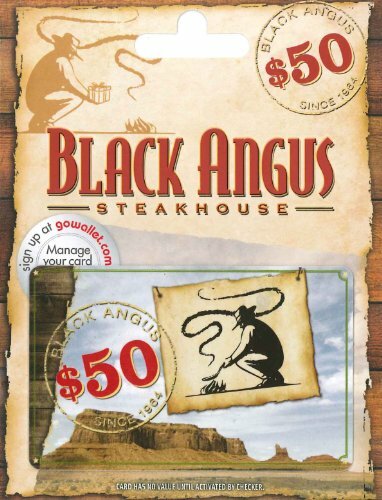 A Black Angus gift card is perfect for the busy family, for a romantic evening out and for anyone who wants a great meal and a great time. Steak lovers! Reward yourself or give someone a gift that sizzles. Give them the gift of steak and they will remember you forever. 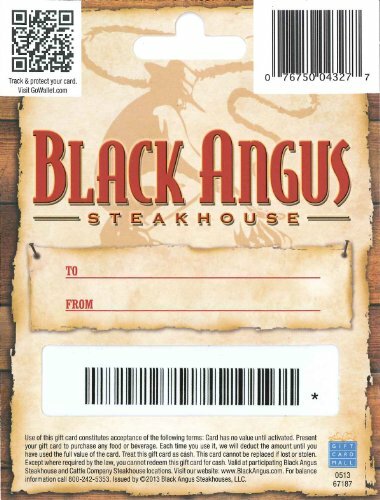 Redeemable at any participating Black Angus and Cattle Company Steakhouse in: Alaska, Arizona, California, Hawaii, New Mexico and Washington.